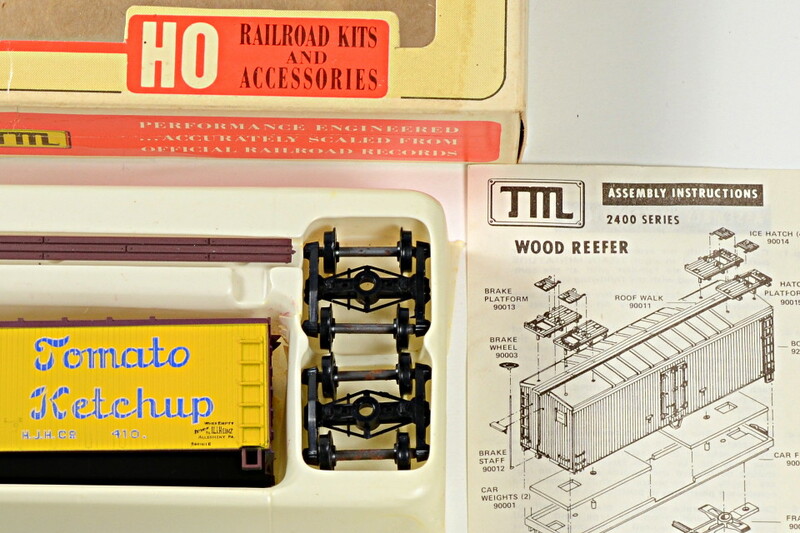 Vintage HO scale boxcar kits! Really! As a comparative newcomer to HO scale, I spent most of my life giving them no consideration whatsoever, even though I was surrounded by them. They’re always on vendor tables at the shows. My back issues of Model Railroader are chock-full of articles and ads about them. They’re a staple hobby item for just about every HO scaler I’ve ever known. That changed I got the idea for the Windlenook Project, and I needed some HO cars cheap. 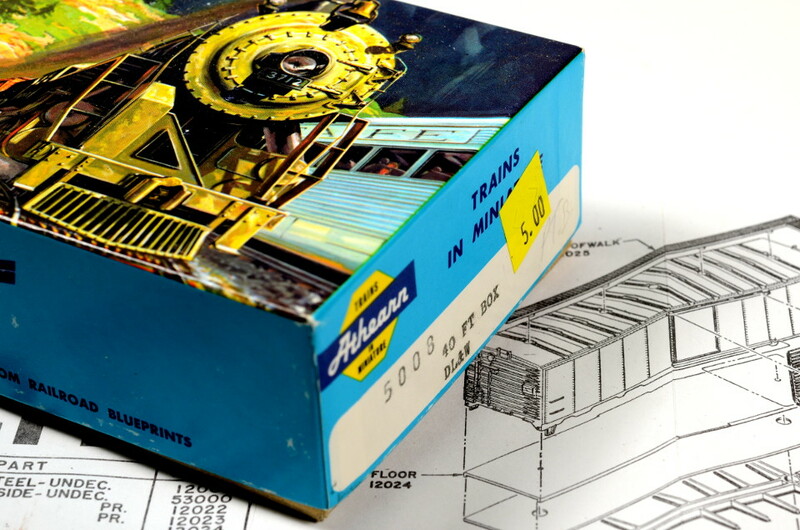 Suddenly, those musty little boxes of Athearn and Train-Miniature began to leap into my welcoming arms. I wasn’t seeking more assembly projects—just a modest roster of colorful, distinctive cars for a switching puzzle. I’d look inside a box, and sometimes the car had been assembled…but sometimes not. Hey, I’m a modeller, I said to myself, I’ll get it anyway, and just build it. For five bucks, what have I got to lose? Maybe I should put this into some context. Over the years, I’ve built a few N scale freight cars from kits. 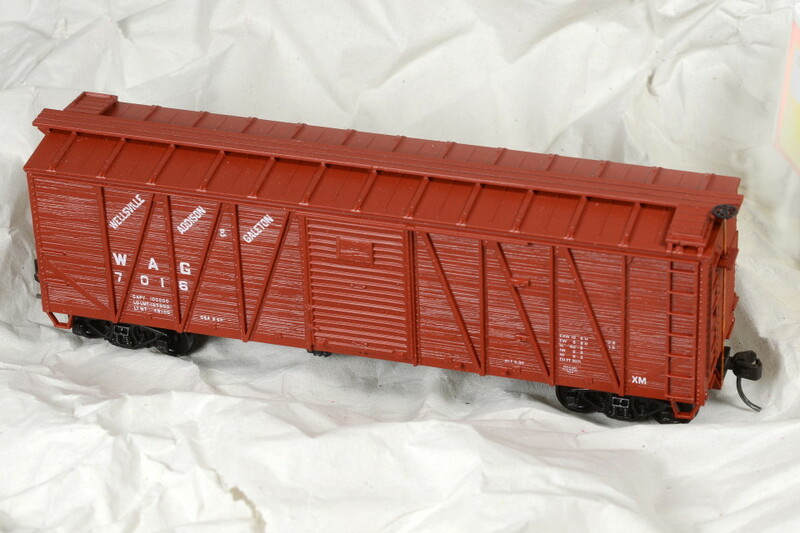 I bought a pair of Intermountain boxcar kits years ago, the ones with all the little details, and they were absolutely maddening. Armed though I was with a dazzling array of hobby tools and a lifetime of experience, I still couldn’t get those tiny little ladders out of the sprues without breaking at least one. Don’t even get me started on the brakewheels. By the time the second one was more-or-less roadworthy, I swore I’d never do another. So, I took a deep breath and dug into my first Athearn blue-box kit. The painted and lettered shell had the roofwalk and doors already attached. Nice! The steel weight was rusty from 30 years in somebody’s basement. After a few minutes at the wire-brush wheel on my bench grinder, it was more than clean enough. It snapped easily onto the chassis. Good! The little manila envelope of small parts was missing. No problem—I was going to toss out the horn-hook couplers anyway, and replacements for the draft-gear lids and brakewheel (along with some Kadee #5 couplers, naturally) were readily obtained on my next hobby-shop visit. Cool! With 15 minutes of actual work, I had a complete, assembled boxcar. Ten minutes after that, coupler heights were checked and corrected, too. Wow, that was easy. Almost too easy. Subsequent cars, with little manila envelopes present and rust absent, were even easier. The only thing remotely difficult was tweaking the occasional errant Kadee to swing freely without too much vertical play. My past experience with Micro-Trains couplers has been helpful with that. I came home from Sunday’s TTCS show with an unassembled Accurail kit of a Wellsville Addison & Galeton single-sheathed USRA wood boxcar. This one cost me a little more than $5, but hey—WAG. The parts count was a somewhat higher than an Athearn kit. During assembly, I dropped the air-brake reservoir into the carpet, and found it again in less than two minutes. The entire project was the best half-hour I had all week.